A legitimate reason to have blood on your mobile device. Dead on Arrival 2, the mobile zombie shooting arcade game currently under development by N3V Games, is ready for you. Well, its beta is ready for you, anyway. The team recently opened sign-ups for the Android beta phase of the game, which will commence June 1st. You'll need a decent Android device, of course, and N3V also warns that potential testers should have an iron stomach and a moral code that allows you to shoot zombified friends in the head. Check and check! Gameplay in Dead on Arrival 2 follows the classic top down arcade shooter format with plenty of guns, plenty of things to use those guns on, and an absolute barrage of eye candy. Dynamic physics endows the environment with more realistic movement, allowing you to bust open crates and watch cloth curtains bend in the wind as you run beneath them slashing zombies with your Ripsaw. The biggest selling point for Dead on Arrival 2 is the graphics. The team squeezed in tons of visual effects, including dynamic lighting and shadows, which is a first for mobile devices. Having ultra-realistic blood splatter may not sound like a big deal, but when you realize all of this is being done on a mobile device, you've got to tip your hat to N3V. 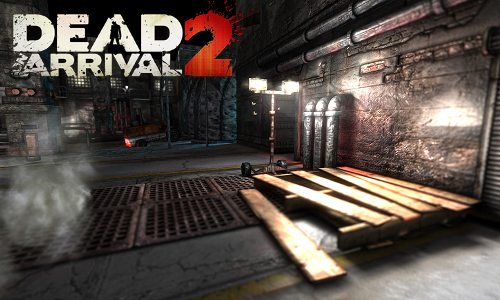 Dead on Arrival 2 is set to release for both Android and iOS devices. Co-op supports four players and will probably be an absolute madhouse of zombie guts and bullets. Page created in 1.0078 seconds.